"Never try to teach a pig to sing. It wastes your time, and it annoys the pig." - Robert Heinlein. Lately, I see that everybody wants to promote their particular breed as an all-around horse, even though it has been bred for hundreds of years to do one or two things, and do them well. This has resulted in a flurry of positively hilarious sale photos. This is a Tennessee Walking Horse jumping. Now, I have to give this girl some credit - she has better form over fences than I usually see posted proudly on the web, and she is wearing a helmet. I must now observe that it's a good thing she's wearing that helmet, because OMG this thing is scary over fences. It looks like it is going to climb the x. Look at it's back legs. WTF? Folks, this horse is not a jumper. 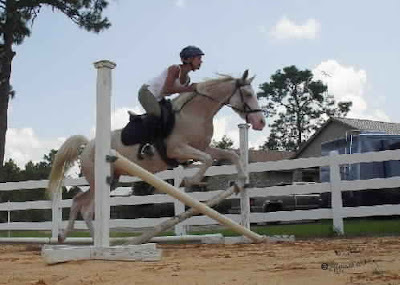 It is a gaited horse that has no idea how to collect itself up and pop over a jump. It is a sweet horse making a good attempt to do as requested, but it is not a jumper. This 15.0 hand roan AQHA mare is advertised as a GRAND CHAMPION in suitability for dressage...hey, congrats on that 4-H show, bet that was fun! 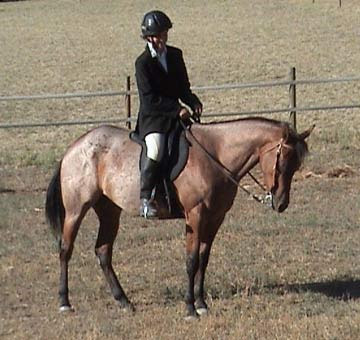 However, in the real world, dressage riders do not go out looking for 15.0 hand roan AQHA mares with straight shoulders, and even if they did, your brag that she "been trained for three years, and ridden though snow and all kinds of weather" at the age of four would send them screaming and running. P.S. The dressage folks love those kimberwicks too. Those are just their favorites to ride in. She "knows how to rollback, spin, neck reign, counter-shoulder, stop and back up" and while I am not sure what neck reigning is (what precisely are you reigning over? ), it seems to me that is a pretty good resume for a western event prospect. For heaven's sake, she's a sports car, stop advertising her as a limo and you might get her sold! Then there's Saddlebred western pleasure, or as it is usually called, the William Shatner Western Pleasure Class. That alone is enough to make most of us giggle, but if the visual of an obese D-list celebrity hitting on a hotel clerk in a really skeezy way in those horrid Priceline commercials isn't enough, just look at the picture on the left. Please. Western riding is a discipline that has sprung out of working cows, you know, those things that milk comes from. Can I let a little heifer loose in one of these classes and see what happens? Pretty please? We can take bets on who stays on the longest. Most of the Saddlebreds I know have spent their lives being chased with fire extinguishers and hooted at. I can only imagine the reaction to mooing. 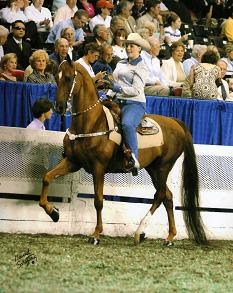 Since by now all of you Saddlebred fanciers are here to tell me you don't chase your horses with fire extinguishers (or attempt to logically explain the necessity of doing so), or are here to tell me your horse is not the least bit scared of cattle, can you do me a favor and answer a question for me? 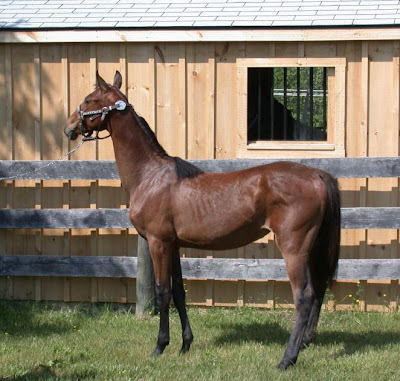 I freely admit my involvement with Saddlebreds is limited to trying to avoid the arenas they were using as the chains and fire extinguishers scared the bejeesus out of the polo ponies, so I will not begin to attempt to critique this filly. But is this what you guys want, for real? Because I think it looks like a llama. 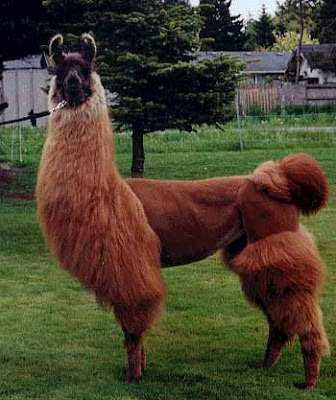 Actually, I think the llama has a better topline.